Give a twist to your traditional Thanksgiving dinner every year and do it outdoors this time! If you are living in an area where outdoor Thanksgiving is possible, you have another thing to be thankful for! Hosting an outdoor Thanksgiving will not only make it even more exciting but also memorable to everyone. 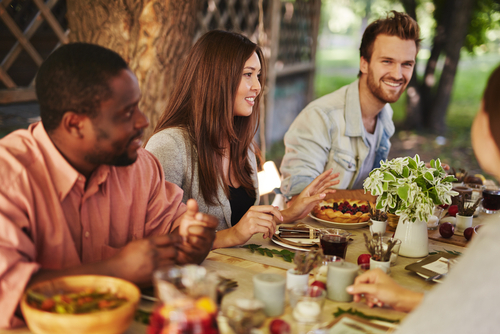 Here are some tips to guide you when hosting an outdoor Thanksgiving dinner. The good thing about Thanksgiving is that you can prepare all the classic dishes ahead of time. You can do the mashed potatoes, bread stuffing, cranberry sauce, pies, and apple tarts the day before the party. More time, less worries. Freshen up your outdoor living areas by cleaning your artificial grass and removing dead plants and vines. It’s also time to set up your fireplace. Make it a presentable and comfortable space for your guests. It is more difficult to keep food warm when it is served outside. One option is to serve inside and dine outside, chafing dishes in a buffet-style setup is another, and you can always hire a serving staff for a more formal vibe. Rain and temperature drop are inevitable. Daylight is also shorter so prepare to have proper lighting. It is better to have a Plan B when the weather wouldn’t cooperate with your original plan. Hosting an outdoor Thanksgiving dinner will surely change things up a bit and can possibly help you start a new tradition! To make a successful gathering with your family and friends, make sure to follow these tips and enjoy Thanksgiving like never before. For more information about design or home staging in Atlanta, HR Staging & Design is here for you.